This page of the website of the Soprintendenza per i Beni Archeologici dell'Umbria contains a two 3D images of the archeological area at Carsulae. Unless otherwise stated, the monuments below were probably built in or shortly after 27 BC, the year in which the Emperor Augustus restored Via Flaminia. A path from the car park leads to the Visitors’ Centre (1), which was built in 2002 and houses the Antiquarium on its upper floor. Walk down the hill to Via Flaminia. The Roman road formed the cardo maximus of the municipium. A stretch of it some 400 meters long was excavated in 1953. The paving probably dates to the restoration of 27 BC, although there is also evidence of a series of later restorations or major repairs. Stretches of the pavement for pedestrians survive near the forum and in front of the Chiesetta di San Damiano (see below). Turn left along Via Flaminia to the Arco di San Damiano. Carsulae never had walls, but the so-called Arco di San Damiano provided an impressive entrance from the north. It originally had three arches clad in marble, but only the central arch survives. The Arco di San Damiano was known as the Arco di Traiano in the 16th century because coins from the reign of the Emperor Trajan (98 - 117 AD) were found nearby. Walk through the arch to see the two mausoleums visible in the necropolis. ✴The larger mausoleum (1st century AD) has a circular plan and was some 4 meters high. Its wall was made of curved travertine blocks and terminated in an elaborate cornice. Part of it has been reconstructed using some of the original blocks and architectural fragments. An inscription (CIL X1, 4572) with the same curvature in Palazza Cesi, Acquasparta (see the page on Finds from Carsulae) probably came from this mausoleum: it commemorates members of the gens Furia. ✴The mausoleum (ca. 27 BC) beyond it is in the form of a cylindrical tower with a conical top. The frieze along the upper part of the cylinder has interesting reliefs. A sarcophagus found nearby in the 1990s contained a lead coffin belonging to a baby girl. The coffin and grave goods (a tiny necklace and earrings made of gold) are now in the Antiquarium. Retrace your steps along Via Flaminia to the forum. The arch on the right, which was recently reconstructed, marked the entrance to the forum from Via Flaminia. It stands on a wall some 2.5 meters high that supports the terrace on which the forum was built. Traces of a matching arch survive [further along Via Flaminia]. Part of the original paving of the forum also survives. The trapezoid-shaped forum was originally paved with slabs of pink marble, some of which survive. The series of vaulted structures along the north side of the forum (to your right as you look at the arch from Via Flaminia) might have been used as government offices or private houses. Today, four rectangular rooms survive, each of which has an apse. ✴The head and the knee of a huge statue (ca. 50 AD) of the seated Emperor Claudius, which were found in the forum, are now in the Antiquarium. ✴The inscribed bases of two statues in honour (respectively) of the Emperor Valerian (253-60 AD) and his son, the Emperor Gallienus (253-68 AD) are now in Palazza Cesi, Acquasparta. These temples in a podium at the south-west corner of the forum (to your left as you look at the arch from Via Flaminia) are identical and were probably dedicated to Castor and Pollux. The temples were built over older structure that probably date back to ca. 220 BC. These were probably used for commercial purposes. This public building was in the form of a rectangular hall with a nave separated by two colonnades from the aisles to the side. The hall culminated in an apse that probably housed the seat of the presiding magistrate. Continue to the east to see the remains of the amphitheatre and theatre. The amphitheatre (photographed here with the theatre in the foreground) was sited in a natural depression. It was discovered in the 16th century but subsequently largely buried by debris caused by floods. It was recognised by aerial photography during the Second World War and excavated in 1955-72. The theatre, which was built to the east of the amphitheatre (i.e. farther from the city centre), was excavated in 1951-5. The style of its construction suggests that it probably pre-dates it the amphitheatre by a perhaps a few decades. Only the lower rows of seating survive. The semi-circular passage that ran behind the seating was originally vaulted. A statue of Dionysus (1st century AD), which probably came from the theatre, is now in the Antiquarium. Return to Via Flaminia by turning left and left again along the north side of the amphitheatre. ✴(CIL XI 4580), in Palazzo Comunale, San Gemini. This is one of a number of cisterns on the site that were used to store water from the natural spring of Carsulae. The site of the spring itself has not yet been found. Turn left along Via Flaminia, past the forum and the Chiesetta di San Damiano, which is beyond it on the left. A community of Benedictine nuns settled on the abandoned site of Carsulae, probably in the 11th century. There were a hundred nuns here in 1220, when Pope Honorius III moved them to another site. In 1230, Pope Gregory IX gave the complex to the Cistercians. 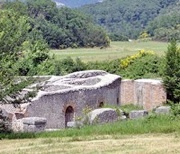 It subsequently passed to the Abbazia del San Pastore, at Greccio (near Rieti). In 1317, the monks are documented as oppressed by the Lord of Poggio Azzuano but protected by Todi. This church (11th century) was probably dedicated originally to SS Cosmas and Damian, who in Christian times took over the function of Castor and Pollux (to whom the twin temples of Carsulae were probably dedicated). It was built on the foundations of what seems to have been the Roman macellum (meat market - 2nd century AD), traces of which can be seen on its right side. The portico was added at a later period using Roman remains from the site. The relief in the tympanum above the portal depicts two haloed figures receiving healing water from the cross. The church was made up of a rectangular nave and an apse with a monofore window. The colonnade to the left seems to have been a later addition; there was probably a similar colonnade to the right, so that the nave was separated from two side aisles. There are vestiges of frescoes on the back wall, to the sides of the apse. The church was restored in 1691. Turn right towards the Visitors’ Centre, with the remains of the baths to the left of it. The baths at the southern entrance to the town were fed by natural springs. They were first excavated in 1783, when a mosaic floor depicting marine scenes [now in Spoleto? 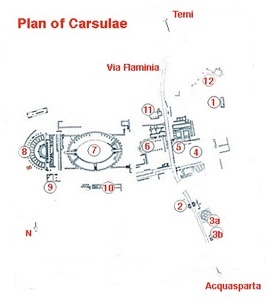 - see the page on Finds from Carsulae] was discovered. The excavations of 1951-72 also touched only briefly on the baths, although the site had already been violated by scavengers. This project identified a rectangular room with an apse and a mosaic pavement. The excavation of the baths was restarted in 2004 and is still underway under the direction of Jane K. Whitehead, Valdosta State University. Return to the Visitors’ Centre, where the walk ends. Return to the home page on Carsulae.